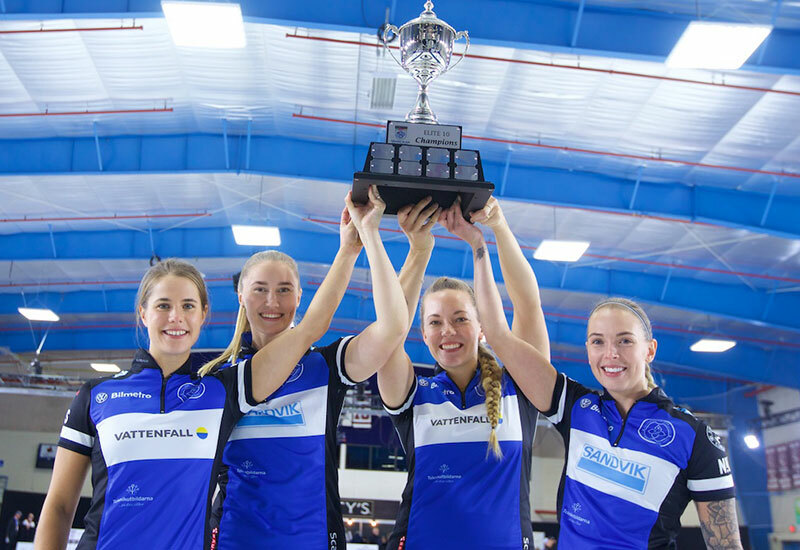 Anna Hasselborg (Sundbyberg, Sweden)(Photo: Anil Mungal) wins the Princess Auto Elite 10, defeating Silvana Tirinzoni (Aarau, Switzerland) 4&2 at the Thames Campus Arena in Chatham-Kent, Ontario. Hasselborg with Sara McManus at third, Agnes Knochenhauer and Sofia Mabergs on the front end take home the $28,000CDN first place cheque along with 78.226 world ranking points, while Tirinzoni receives $16,500CDN and 57.366 world ranking points for their second place finish. Starting with hammer, Hasselborg pushed the first two end, then scored 2 with hammer to take a 1UP lead. From there, Hasselborg proceeded to steal the next 3 ends to go 4UP and win the game with 2 ends to go. In the semifinals, Hasselborg defeated Rachel Homan (Ottawa, Ontario) 1UP and Tirinzoni defeated Jennifer Jones (Winnipeg, Manitoba) 1UP. Jones won $15,500CDN, while Homan won $11,500CDN along 44.328 ranking points for their semifinal finishes. In the quarterfinals, Tirinzoni defeated Laura Walker (Edmonton, AB) 2&1, while Homan defeated Casey Scheidegger (Lethbridge, Alberta) 2&1. Scheidegger won $10,500CDN, while Walker earned $9,500CDN along with 15.645 ranking points for their quarterfinal finishes. Hasselborg went 4-0 in the 10 team round robin pools qualifying round. In their opening game, Hasselborg defeated Jamie Sinclair (Chaska, USA) 3&2, then won against Scheidegger 2&1, Nina Roth (Chaska, USA) 2UP, and defeated Homan 1UP in their final qualifying round match.